Ancient Egypt is a huge theme for many slot designers, because it is such a colourful and exciting era. So, it can be difficult to come up with something new which will excite gamers. But Microgaming have done it again with Wild Scarabs, so head to those sandy dunes as we look for treasures. 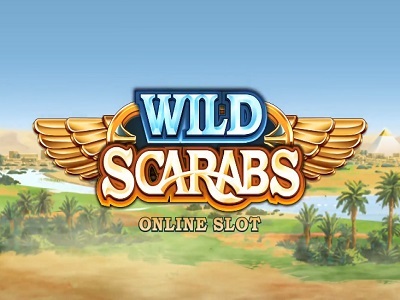 Wild Scarabs is a 5-reel, 243 ways to win slot game offering an RTP of 96.28% for all players. Set against a backdrop of pyramids and sand dunes, Wild Scarabs is a game that oozes luxury from every corner. The symbols are taken from Egyptian mythology such as the eye of Ra, the ankh and of course the gods. Bet Amounts – Betting on Wild Scarabs begins at 20p per spin and can be increased to a maximum of £60 per spin. To change your bet simply select the plus or minus to either side of the bet amount, until you reach your desired option. Always make sure you have double checked the spin amount, as once you click you can’t take it back. Wild Symbol – The blue scarab is your wild symbol and it will substitute for all other symbols except the scatter. It also forms part of an interesting feature, as well as being the second highest paying symbol. Offering 150 coins for landing three and a whopping 2,250 coins for landing 5 on a winning line. Scatter Symbol – A staff head makes up your scatter symbol. Landing three or more of the scatter anywhere on the reels will trigger the bonus spins round. You will be happy to hear that the scatter is the highest paying symbol in Wild Scarabs and if you land 5 on a winning line, you will be awarded a 6000 coin win. 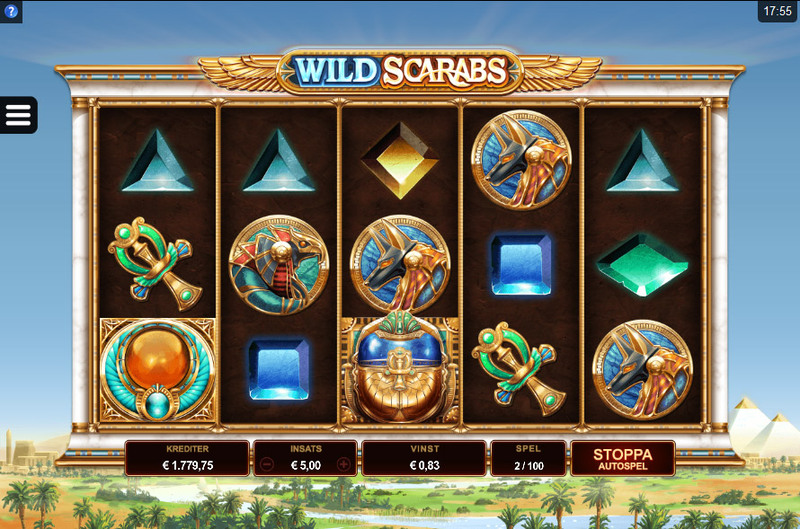 Wild Deal Feature – This feature occurs at random and will only trigger on a non-winning spin, if the wild scarab is on reel 3. If this happens, up to four extra wilds will be added to the reels to help form a guaranteed win. Bonus Spins Feature – Three or more of the staff head scatters anywhere on the reels will trigger this feature. An allocation of 10 bonus spins will be awarded for you to play through, but the bonus spins cannot be retriggered during the feature. However, during the bonus spins any wild that does not form a win is collected and once you have three or more they are placed back onto the reels. The one interesting thing about this feature is that although it can’t be retriggered, it can be extended. If you have stashed scarabs at the end of the spins but have less than the three needed to be placed on the reels, the spins will continue until you can claim them. Meaning the chance of more spins is there if you are lucky enough to get them. Overall Wild Scarabs is an interesting game, it plays fast and the animations on the symbols were fun. The wins came relatively fast and we triggered the features often enough as well. The background music wasn’t much to our taste, but after a while we became that focused on the game it was irrelevant. The game itself is really simple to play once you get your head round it and we can see why it is becoming popular with all experience levels.